I think I speak for more than just myself when I say that my least favorite part about being a makeup-wearing human is not putting the stuff on, but taking it off. Like someone who loves to cook but hates doing the dishes afterward, I will giddily load up my face with foundation, concealer, powder, blush, bronzer, highlighter, the works, but when the end of the night arrives and it's time to erase it all, I'm flooded with dread. Most of my frustration stems from the fact that thoroughly removing my face makeup is a time-consuming task, requiring intensive combinations of cleansing oils, gel cleansers, and makeup wipes to have any hope of getting all the gunk out of my pores. Not to mention I am ethically in conflict with all the disposable pads and wipes the process requires. I'm ashamed to admit this, especially as a beauty editor, but as a result, there's at least one night out of every week when I say screw it and go to bed without taking my makeup off at all. Yes, I feel you cringing at me, and yes, I deserve it. So last year, when this Australian-made reusable makeup-removing pad called Face Halo hit Byrdie HQ, I was deeply intrigued. 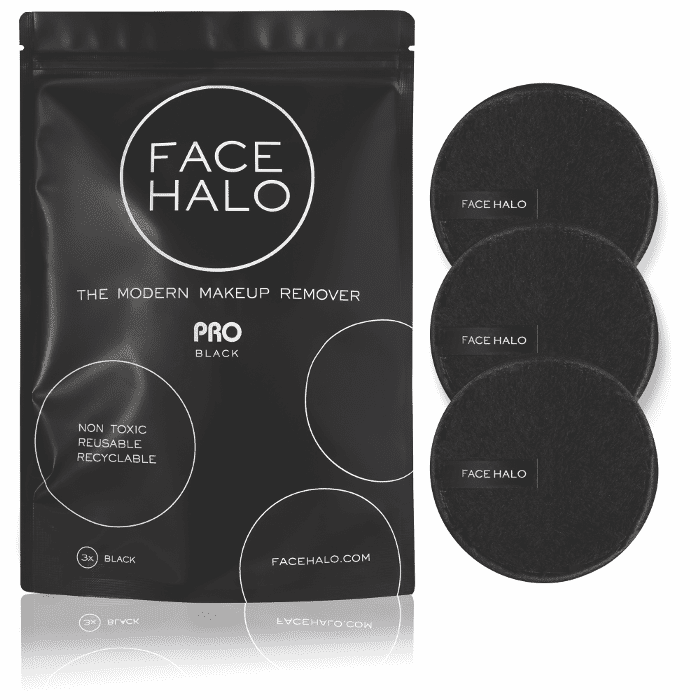 Face Halo, which comes in a pack of three, is this incredibly absorbent plush pad that you just soak in regular tap water, and then glide over your face to remove your makeup. The pads are made of a special high-performance, ultra-fine form of a microfiber (HaloTech Fiber, the brand calls it), which was designed specifically to pick up makeup and dirt from human faces—pores, crevices, and all. The original Face Halo has a white surface, which allows you to see how well it's working because it quickly becomes totally covered in makeup. Once the pads get totally dirty, after two uses or so each, you just throw them in the washing machine along with the rest of your laundry and are then free to use them again, good as new. Our wellness editor Victoria reviewed the Face Halo right after its launch and was impressed by how easily it removed her face makeup using nothing but water. (That review is above.) I got my hands on a trio of pads a few months later and was equally smitten with how well it took off my foundation, lipstick, and mascara. I was even more convinced after watching the brand give a demonstration to prove how much better the HaloTech picks up product than a regular makeup wipe: A Face Halo rep performed a side-by-side comparison in which she applied foundation to the skin of a grapefruit, which has pores similar to humans', and then removed half of it with a makeup wipe and half with the Face Halo. While the wipe left some foundation behind, the Halo was able to get inside all the nooks and crannies to pick up nearly every remaining trace of product. Hollywood makeup artists were also taken with the product as soon as it came out and began adding to their kits in place of makeup wipes. Just a few who've sung its praises are Monika Blunder (whose clients include Amanda Seyfried and Emilia Clarke), Rachel Goodwin (Emma Stone, Selma Blair), Lisa Aharon (Anna Kendrick, Rachel Brosnahan), Molly Stern (Reese Witherspoon, Lily Collins), and Jamie Greenberg (Elisabeth Moss, Jessica Alba). "It's nice to the skin because it isn't stripping it with harsh ingredients or textures, so I don't have to worry about disrupting my clients' PH balance," Goodwin said of the product. The OG Face Halo, with its bright white surface, though great for an at-home user, wasn't exactly ideal for makeup artists, since it could get stained inside their kits and look less than professional. So the brand had an idea to come up with an all-black version named Face Halo Pro. The all-black product just hit the market today, so now consumers can decide whether they want the white version, so they can see how well their Face Halo is working, or the black version, which looks a little chicer and cleaner. Both are the exact same price, $22, and made of the same sustainable HaloTech material. Makeup artists are already using the Face Halo Pro on their celebrity clients and are freaking out so hard over it, making us want a trio of these chic black disks for ourselves. After all, we've been wracking our brains to think of a makeup remover that's both more elegant-looking and eco-friendlier, and we can't come up with anything. Just this week, Lisa Aharon used the product on her client Anna Kendrick and said, “If you are looking to make a change in the world as a makeup artist, this is a great place to start." Want more product reviews? Don't miss the other Australian makeup brand Byrdie editors can't stop talking about.